A soldier returned injured from war, unable to get work and settle into civilian life, makes for himself a home an a bit of wasteland next to the local graveyard, and ekes out a living dependent upon the kindness of strangers. This could be a story of any town in any age, but it just happens that this is the story of Corporal Staines, veteran of Nelson’s navy, Brighton 1810 or thereabouts. Corporal Staines lived in a chalk pit in what is now the St Nicholas rest garden, and when moved on from there, in a succession of spaces – behind the church, at the Level, Rose Hill. The corporal made a living exhibiting miniature models which he carved from chalk of soldiers and cannons, and also a model of the gallant ship – the Victory – bearing, under a black canopy a coffin containing the body of the Hero of Trafalgar. At the great feast days held at the Level he would fire off Royal salutes from four pistols mounted on his model ship, and was rewarded with a share of the food. It is a story from 200 years ago, but versions of it are still being played out in Brighton of today. A piece of film and music inspired by his life recently came my way. Here it is. At the start of 2017, one of the remaining box-tombs at St Nicholas Rest Garden collapsed. The council Parks department needed to take swift action to make the monument safe, and removed the brick pier and inscripted side pieces and lowered the capstone to ground level. It was a sad start to the year, and – we thought – marked a further loss to our archive and heritage. The council – although it manages most of the burial sites in the city – does not have the resources for maintenance of this kind, or the responsibility, as properly the monument remains in the care of the descendants of those remembered. And – especially for older monuments, these are hard to find. But…sometimes they are. And sometimes they will rise to the occasion and come together to preserve the memory of their ancestor – and with Edward Gillett, such was the case. Long residing in other parts of the globe, the Gillett family were contacted and agreed to fund this handsome restoration of the monument to Edward Gillett, revealing clearly the inscription on the south facing side which had not been previously transcribed which commences “EDWARD GILLETT Gent”. Thanks extended to the Gillett family for taking this action which preserves a part of their own family heritage, as well as helping to protect the living library of our dear departed which is the St Nicholas Grounds. The very first post on this site pondered the origins of the Bound Man – a lowered box tomb bearing these little figures beneath a coat of arms, but too worn to make any sense of it. Advice given at that time was to look north, as the bound man icon was a thing of Scotland, but without the identity of those remembered, the trail soon went cold. Following the re-emergence of the site plans for the rest garden however, things started to fall into place. A short distance away from the bound man tomb, and laid flat on the ground is an inscripted piece to the memory of Laurentia Ross and Francis Robertson covered in the piece Laurentia Dorothea and the peniless portrait painter, which looks at the friendship between Laurentia and the artist Sir Thomas Lawrence. From the rediscovered plans it becomes clear that the Roberston Ross panel and the Bound Man tomb are part and parcel, and had become separated for no clear reason during the last clearances in the 1940’s. William Forbes Skene, who in 1881 held the position of Royal Histographer of Scotland declared the Robertsons of Clan Donnachaidh to be the “oldest family in Scotland”. Clan Donnachaidh gave the last Celtic kings of Scotland in the line of King Duncan (killed by MacBeth) and, from the last of the Celtic earls came Duncan of Atholl, considered the first chief of the clan. During the Wars of Independence, King Robert Bruce was defeated at the Battle of Methven outside Perth in 1306 and fled into Atholl where he was given protection by Duncan. They fought together at the battle of Dalry and Duncan and his clan were beside their monarch at Bannockburn. Duncan named his eldest son and heir Robert after his king. Walter was tortured over a period of three days. On the first, he was put in a cart with a crane, hoisted up, dropped, and jerked violently to a stop to stretch his joints. He was then placed in a pillory and “crowned with a diadem of burning iron” bearing the inscription “King of all Traitors”. On the second day, he was bound to a hurdle and dragged along the high street of Edinburgh. On the third, he was disembowelled while alive, his entrails burnt before his face, and his heart was torn out and burnt. Finally, his corpse was beheaded and quartered, and the quarters displayed around the realm. 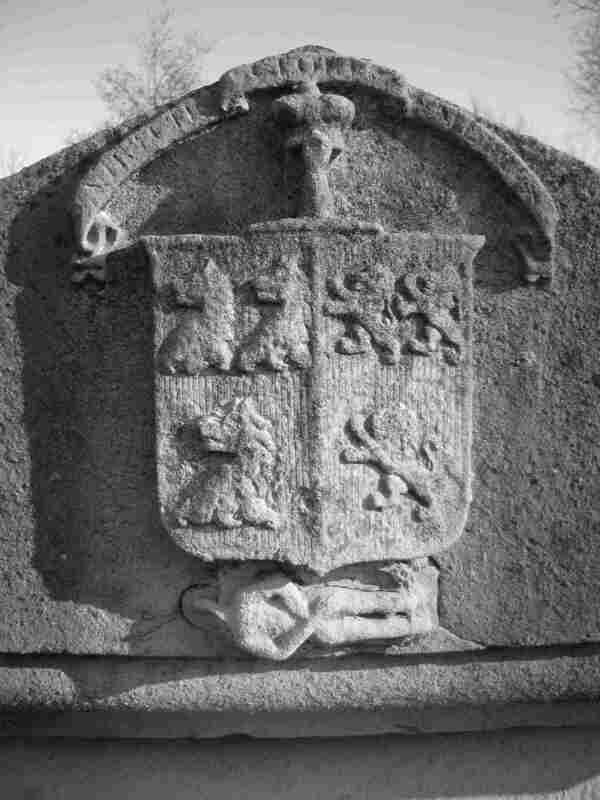 As reward for their part in his capture, Clan Donnachaidh were permitted an additional device to their coat of arms – the man in chains, as evidence of their part in the capture, alongside their motto “Virtutis Gloria Merces” (Glory is the reward of valour). Following the clan passing from Robert Riabhach to his son, the name Robertson, in honour of his father, became the preferred surname of the clan. We still know little of Francis Robertson and how he came to Brighton but we do understand more of the bound man – one of our more striking funerary motifs, and we have extended the reach of our archive of stones and bones to include a little piece of Scotland. Sacred to the memory of Elizabeth, widow of Edward Gillett died August 29th. 1859 aged 91 years, also Elizabeth Miles, sister of Mr Edward Gillett, died November 9th 1852 aged 72 years, also of Mr Edward Gillett Gentleman who departed this life June 19th 1850 aged 77 years. TOMB TO BE LEFT. Copyhold houses,17 and 18 West Street,Brighton. At his death, he was placed in the Rest Garden, marked by a substantial box-tomb, which stood the test of time, and was spared during the 1940’s clearances – TOMB TO BE LEFT, and it has accordingly remained in place. Until now that is. Over the Christmas period the end panel came away, exposing the supporting brickwork and rendering the whole structure vulnerable to collapse. The council acted swiftly to fence the monument off, as in its current state it is a real hazard. Although the council may be responsible for a closed burial ground, the monuments remain the property of the deceased – or more properly, the descendants of the deceased. As a closed burial ground within the purview of the Archdiocese of Chichester, any works to monuments cannot be undertaken without the permission of the Bishop of Chichester – or authorised representatives. Within the administrative area of Brighton & Hove City Council can be found many thousands of monumental pieces, around churchyards, in cemeteries and burial grounds. Although the council takes on maintenance of these spaces, they do not have resources to become involved in conservation and repair unless in exceptional circumstance. 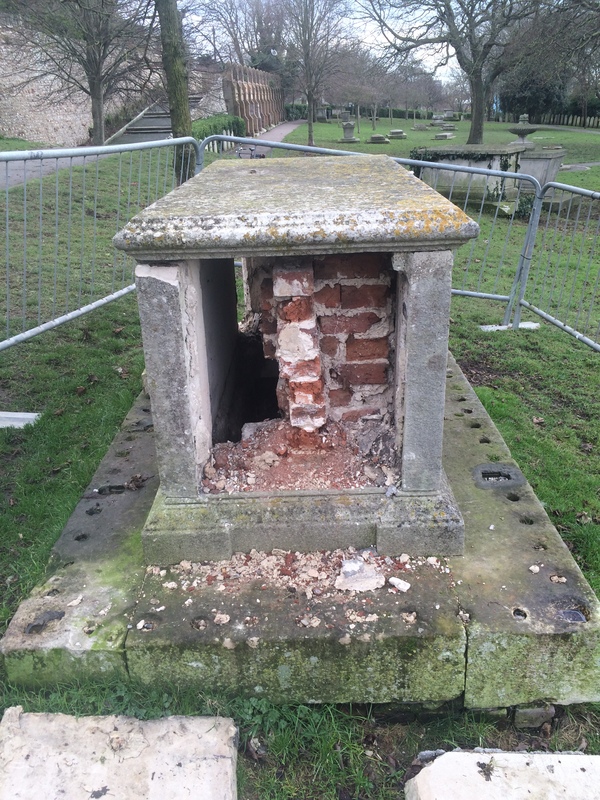 Because of the parlous state of the Edward Gillett monument, and the risks which visitors to the site may be exposed to however, the council will be taking action in this case, although this will involve removing the brickwork and lowering the box to lay surviving pieces flat upon the plinth. This is a shame, as there are very few remaining box tombs at the site, and efforts have been made to contact descendants of Mr Gillett, who may – even at this distance of time – be prepared to finance a fuller restoration, but making contact is no easy task, and unless something can be arranged over the next week, the planned stabilising works will have to take place before the remaining pieces simply collapse. So all in its quite a sad start to 2017, as another piece which makes up our archive of stones and bones slips away from us. But this is part and parcel of this place – gradual fading and eventual loss – we can observe, record and , to an extent maintain – but in the end, things fall apart. Many aspects of life have been touched by technology and changed irrevocably, and it seems reasonable that this should also hold for aspects of death. If the life of Sake Deen Mahomed (for example) had coincided with the advent social media – being as he was such an adept networker and self publicist – he doubtless would have taken full advantage of it, with the bits and pieces of his life left online in memorium for all the world to see. Facebook provides ghost hosting for the pages of members deceased, and other online ventures aim to extend the memory of those passed with a greater richness than can be accommodated within the character limiting gravestone. For those remembered at St Nicholas, the times in which they met their end offered only the blank stone as a canvass for their final status update, and although the term ‘carved into stone’ is used to suggest unconquerable permanence, a short stroll around the ancient ground will quickly disprove this notion as many of the inscriptions have become worn beyond recognition. At the last head count, which took place in the late 1940’s, some 2,500 monuments were recorded, with their inscription transcribed where possible. These comprised: 623 in the Northern Extension, 1346 in the Churchyard and 556 in the Rest Garden. Many of the inscriptions were illegible, and most simply record the name of the person remembered and the date of their death, but some (around 300) offer additional information on how they passed their time before they passed away. Here lie all that is mortal of SOPHIA wife of CHARLES PHILLIPS died of consumption June 5 1851 aged 27 years. We think of the Brighton of today as a place of incomers – constant pressure on our town to squeeze in more from other places. That it has been this way many years, is attested by the number of inscriptions describing the person remembered as from another city, town or country -those whose quest for a new life by the sea ended at the hill above it. It is hard in the end to judge how the digitally described funerarial future may compare with the mason made memorium of the present and past. The richness of detail may be a boon for historians yet to come, but the sheer scale and ubiquity of personal and social data may make the job of the investigative historian somewhat redundant. Also, there is something about the passage of time and cycle of life that requires decay – we cannot burden the future with maintaining our memory for ever, and the piece of stone in a public place, which weathers, wears and crumbles, is a good way of easing us to one side over time, and has a gentleness which a digital archive is ill suited to achieve. Fleeing the family home in her early twenties, she was fortunately given support from her sister who had already broken the bond, and particularly by her brother in law, David Ricardo and his brother Moses whom she eventually married. Whether this correspondence precipitated the production of ‘harmony and peace to a divided family’ we do not know, and can only speculate upon the impact it may have had. For a young man in his twenties to berate his father in law – an accomplished and respected surgeon – in this way though, belies a certain strength of character (or arrogance) on the part of David, and as his life progressed he achieved fame as a renowned political economist. His key theory – that of comparative advantage – remains the cornerstone of the argument in favour of international free trade. Comparative advantage paved the way for the promotion of globalization via increased international trade, which is the guiding theme in the policies promoted by the OECD and the World Trade Organization, where it is assumed that international trade automatically leads to increased economic prosperity. David made the bulk of his fortune speculating on the outcome of the Battle of Waterloo in a way that seems both familiar and morally odious today. He had arranged to receive early notice of the outcome, and upon hearing – before most others in London – that the English had been victorious, he set about creating the impression that the French has won by openly selling British securities and creating a market panic which saw their price plummet. When they had hit rock bottom, he bought them back at a massive discount. His reward for attacking the finances of the nation during wartime for personal gain was “upwards of a million sterling”. Married to David’s brother Moses, little else is recorded about Fanny’s life. Moses became a surgeon, but stepped down from practice due to ill health and the couple retired to Brighton. Fanny died at the age of 60 and was buried at the St Nichols northern extension – now the children’s garden. Her monument survived the clearances but was moved from its initial location to a spot at the perimeter behind the houses on St Nichols Road. After her true identity was discovered/revealed, they were discharged from the forces, married and lived happily for 20 years until Golding died. Phoebe also outlived her second husband, Brighton Fisherman William Hessel, and life with and without him was hard, with frequent recourse to the parish for support of one kind or another. As a widow once more, Phoebe scratched a living pedalling goods at the surrounding villages, and it was in one of these trips that she came across James Rook at the Red Lion Public House at Old Shoreham. From his conversation she perceived that he had to do with a highway robbery of the mail horse at Goldstone Bottom which had recently taken place. Phoebe informed the authorities of her suspicions and Rook was taken in and subsequently found – with accomplice Edward Howell – to be guilty of this act. As the bodies decayed, bones dropped through the iron bars and onto the ground below – many collected as morbid relics by locals. Erredge reports of a Brighton Alderman in proud possession of a tobacco stopper made from a finger bone of Rook. Sinister curiosity was not the only motivation for acquiring their bones. Rooks mother – devastated by the loss of her son and the manner of his end – took to gathering as many as she was able, and when the grizzly remains were finally lowered, she buried them in secret in the grounds of Old Shoreham Churchyard. Her story caught the attention of poet Alfred Lord Tennyson who used it as the basis for ‘Rizpah’ which is so compellingly illustrated at the start of this post. Phoebe continued life in Brighton, becoming – due to her great age – even more of a local character. Not wholly pleased, she complained “Other people die – I cannot”. Phoebe died at Brighton aged 108 and is remembered with a headstone at the ancient ground. Also commemorated at her birthplace in Stepney where she was sometime remembered as the ‘Stepney Amazon’, adjoining streets Hessel Street and Amazon Street, and nearby Golding Street were named to celebrate to her long and unusual life. The clearances which have taken place at St Nicholas Ground over time – but most significantly around 1950, removed many the monumental markers from the central areas, relocating them around the perimeter of the sites or removing them from the site entirely. This means that in many cases, the burial marker is now some distance from the person remembered. Martin Archer Shee (for example) – former President of the Royal Society “skilful portrait painter, perfect gentleman and atrocious poet” is remembered by a monument in the Garden of Rest. From plans of the site recently acquired we can now track the final journey of his headstone and locate the original burial place – in which his remains remain (X marks the spot). This set of plans had been thought lost to time, and although work had been carried out to re-map the site, this was only able to show what remained in place at the time and was a limited resource, so it was excellent that the originals resurfaced as historic materials were bright together from various archives for inclusion at the new local history centre at The Keep. 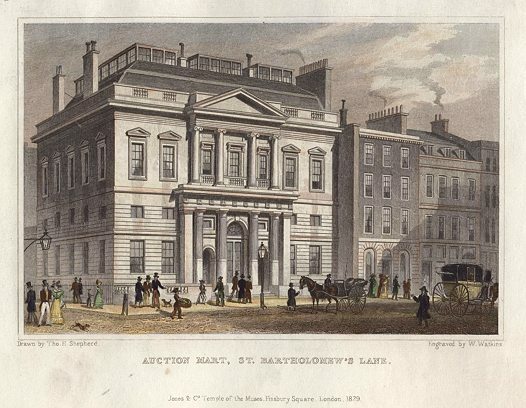 The extent of trade undertaken in nearby coffee houses led a number of auctioneers to erect an edifice wholly devoted to their business, and in 1808 the youthful Walters was awarded this prestigious commission which he fulfilled to general acclaim – although the completed building did not long survive its author, being demolished in the 1870’s. At around the same time as the work on the Auction Mart, Walters also delivered smaller works, including enlargement of the Old Black Lion in Poplar the better to accommodate its customers – ‘lewd and indecent persons’. Walters died at Brighton in 1821 at the age of 39, reportedly the result of chronic overwork. He was buried in the ancient ground, although he location of his final resting place is lost to time. in 1783, when the Prince of Wales first came to Brighton he was a supporter of the Whig party, and the political face of the town adopted his politics as they adopted the Prince. Although, when in 1811 – as Prince Regent – he swapped sides finding his prospects better served by the Tories, the people of Brighton retained their radical outlook and stayed distinctly whigish, with a nonconformist spirit which remains evident in the present day. At that time the affairs of the town were managed by the Vestry, responsible for the appointment of various public offices and duties and the setting of rates. 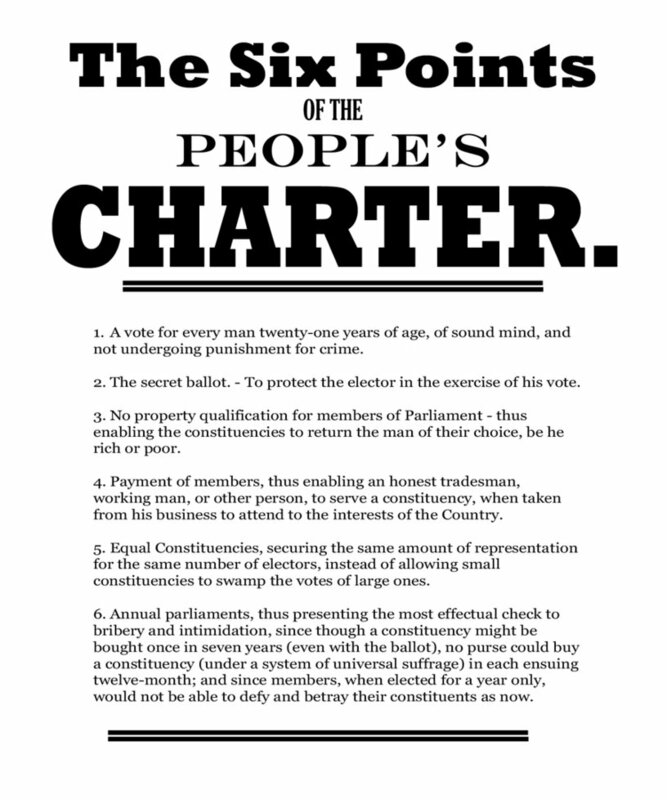 In 1838 – making its position on reform amply clear – the Vestry published of copy of the Peoples Charter in its minute book: An ongoing local battle which peaked in the early 1840’s concerned the upkeep and management of the newly built St Peters Church. 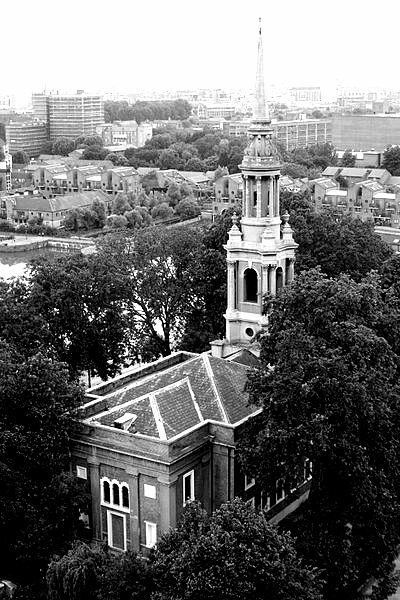 The Church authorities felt that local rates should contribute to their needs, however the vestry – backed by a nonconformist population – saw it as unfair that the general population regardless of observance, should support the Church of England, whilst other faiths and denominations were required to fend for themselves. 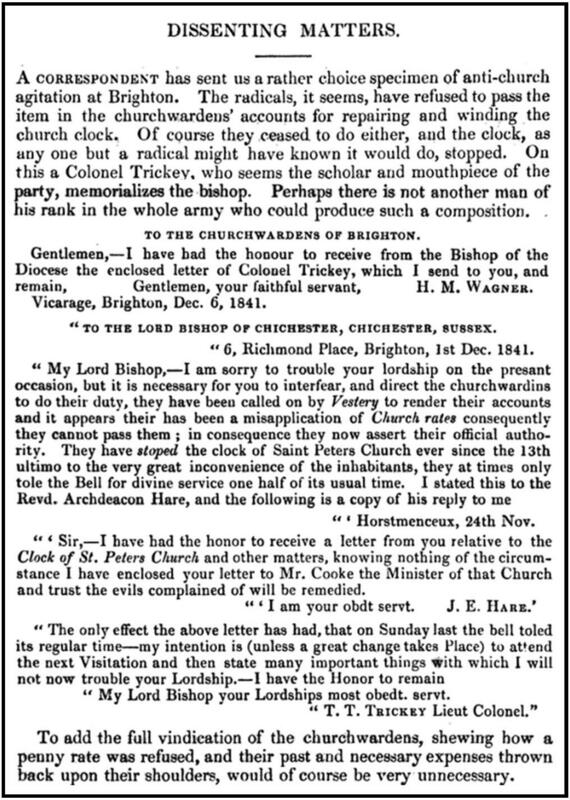 On numerous occasions the Vestry sought to refuse requests from the church for support from the public purse, insisting that such costs should be met from voluntary contribution rather than compulsory levy, and prominent among the opponents of the church was local radical and member of the Vestry – Lieut Colonel Trickey.